Welcome to the Turtle & Tortoise Thermometers superstore! Like all cold-blooded reptiles, turtles and tortoises require that their environments be kept at relatively high temperatures in order to preserve healthy levels of activity. While the options for heating your pet's terrarium are numerous and effective, it is equally important to make sure that you keep the tank's temperature within the ideal range for your particular shelled reptile. Land tortoises come from generally dry, arid environments, while aquatic turtles usually prefer more humid, tropical habitats. Replicating these types of conditions is crucial for getting the most out of your pet. Pet Mountain's Turtle & Tortoise Thermometers store features top quality products from the most trusted names in pet reptile health and terrarium equipment, including Zoo Med, Exo-Terra, and Zilla. Our low price leader, the Zoo Med Repti-Temp Rheostat Manual Heat Controller provides manual heat control with just a turn of the knob. This single features simple operation and allows you to adjust the temperature of most non-thermostatically controlled heating devices! Turn your heaters up in the winter and down in the summer depending on your inside house temperatures! 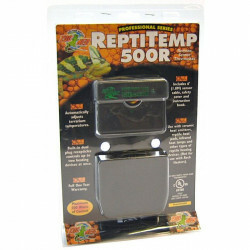 The Repti-Temp is great for use with Zoo Med's Repticare Rock Heater, Ceramic Heat Emitters, ReptiTherm Under Tank Heaters, incandescent heat bulbs (up to 150 watts) as well as other reptile heat devices. 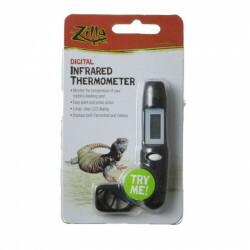 If you're looking for a great deal, our Zoo Med Digital Thermometer for Terrariums can be used as a Wet or Dry thermometer. It is ideal for terrariums, aquariums, or reptile incubators. The 39 inch long temperature probe can be placed throughout the terrarium for pinpoint accuracy. Our discount Zoo Med ReptiTemp 500R Remote Sensor Thermometer is able to control multiple heating devices and has convenient adhesive pads for mounting. 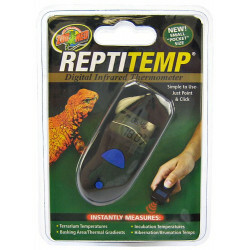 This thermometer is excellent for use with Zoo Meds Ceramic Heat Emitter and the Repti Therm Under Tank Heater. The safety cover prevents accidental bumping of the temperature control dial! When used in conjunction with a timer, natural conditions are replicated by providing the proper photoperiod for your reptile, along with a beneficial nighttime temperature drop (consult a good book on your species to determine its specific temperature requirements). Pet Mountain carries thousands of quality pet products at low, low prices. Feel free to browse through any of our specialized stores to find the exact item you need! Pet Mountain products are guaranteed to meet your satisfaction. We do everything we can to work with our manufacturers to ensure that you get the quality you expect, the service you deserve and the best prices in the industry. At Pet Mountain, we buy in bulk and develop programs with our network of suppliers that focus on giving you more for your money. Like you, we care about our pets. Its all about giving our dogs, cats, birds and other pets a good life! At Pet Mountain we know that your pet is one of the most important things in your life. How? Because ours are too! Your pet deserves to have the very best the industry has to offer, and we are committed to making sure you have it at crazy low prices. Providing you with the very best supplies for your dog, cat, reptile, bird or small critter is our privilege. Keeping a pet should be fun - let us help you keep it that way!